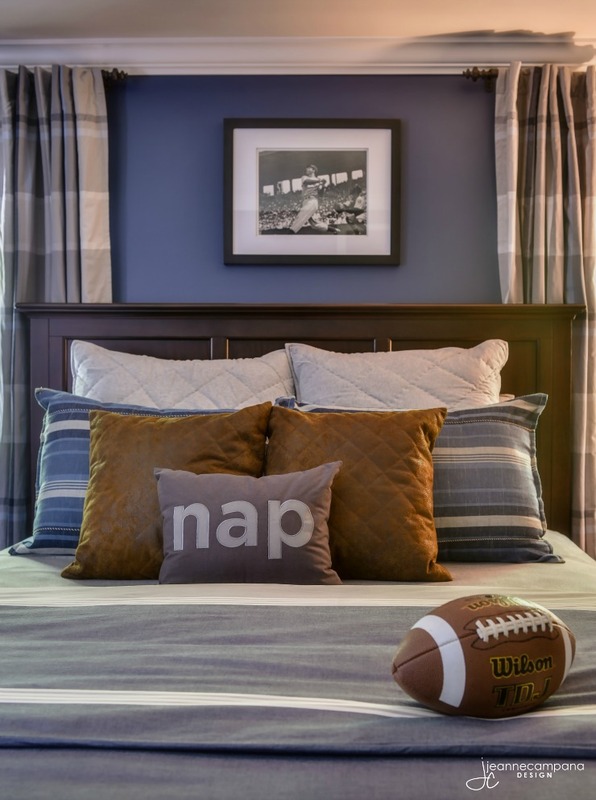 Determined to give each one of my children a comfortable and relaxing space that expresses their own personalities, I spent many late nights designing and sourcing furniture and materials starting with my oldest son Nick’s spacious bedroom. Most 16 year olds have strong opinions and he was no different. 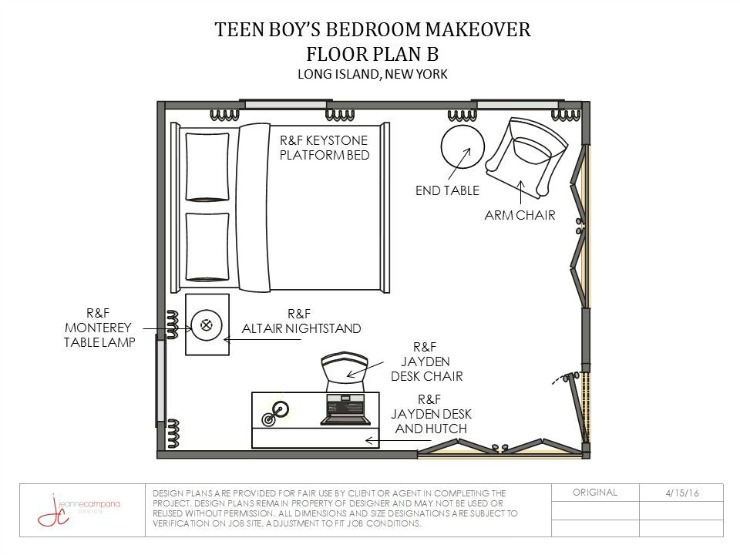 So when Raymour & Flanigan contacted me and asked me if I would be interested in partnering with them through their brand influencer program, I thought to myself…”A teen bedroom makeover would be perfect”! As the largest furniture retailer in the Northeast region in the US, I knew Raymour & Flanigan would have plenty of furniture choices to suffice my son’s ever changing opinions. 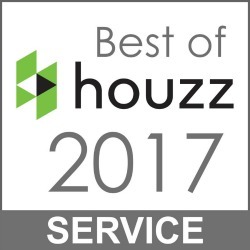 Not only was our local showroom filled with a vast array of styles and colors, but there were even more choices available online on their website. 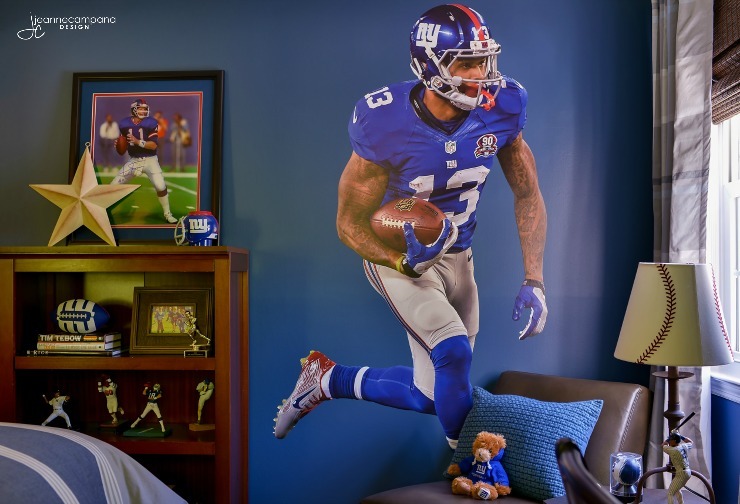 Well, it’s been months in the making and I am excited to reveal my son’s teen bedroom makeover. But first, let’s take a look at the “BEFORE” photos. This room started out as a shared space for my two boys when we moved into this home 11 years ago. 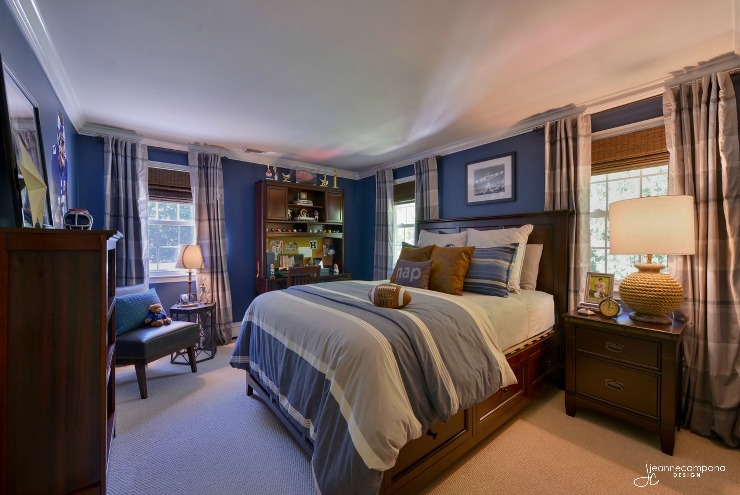 When we decided to give each of my sons his own separate room, my now 14 year old son Joe, took over this space for his bedroom and we filled it with hand me down furniture while Nick moved into another bedroom in our home. 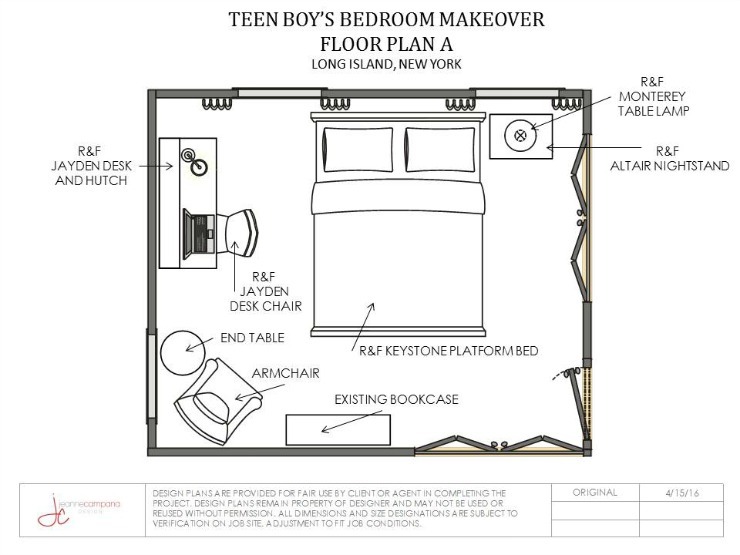 When planning this next round of bedroom makeovers, my sons decided to switch rooms and Nick moved back into the room that he once shared with his brother. 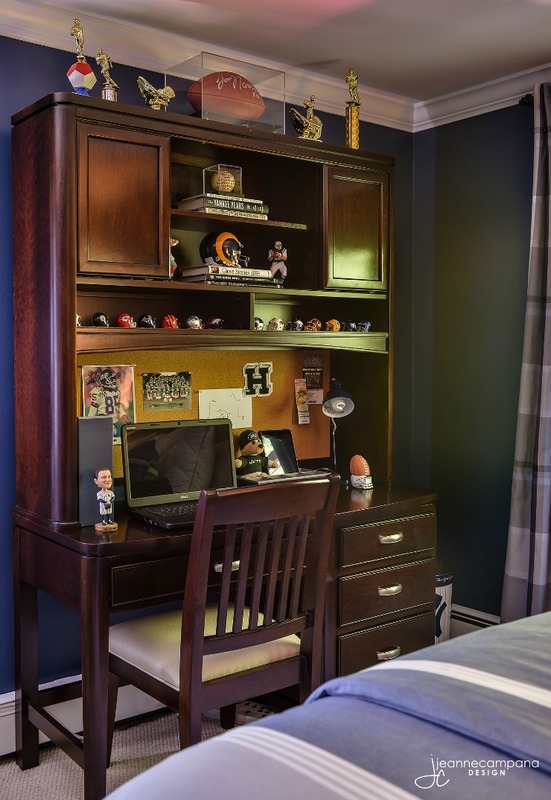 An avid sports enthusiast and a high school football player with plans to someday major in sports management, I wanted to give Nick a room to enjoy now as well as one to look forward to coming home to when he leaves for college. I came up with two plans for the space and ultimately Plan “A” won. 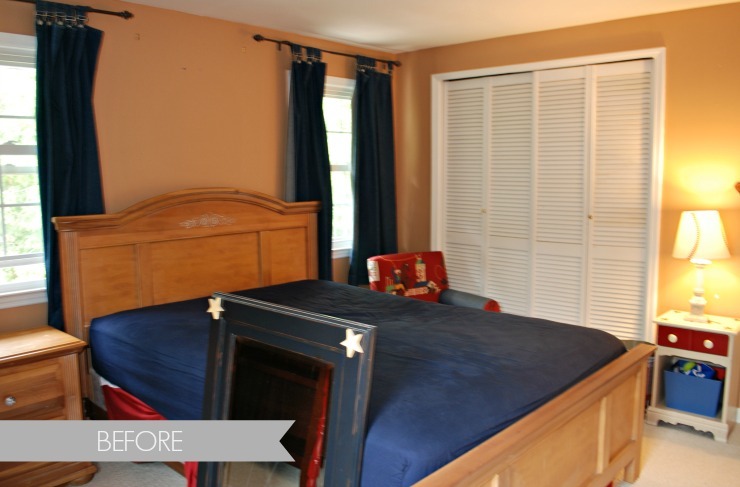 We started by painting the room a rich navy blue and the color instantly transformed the space. 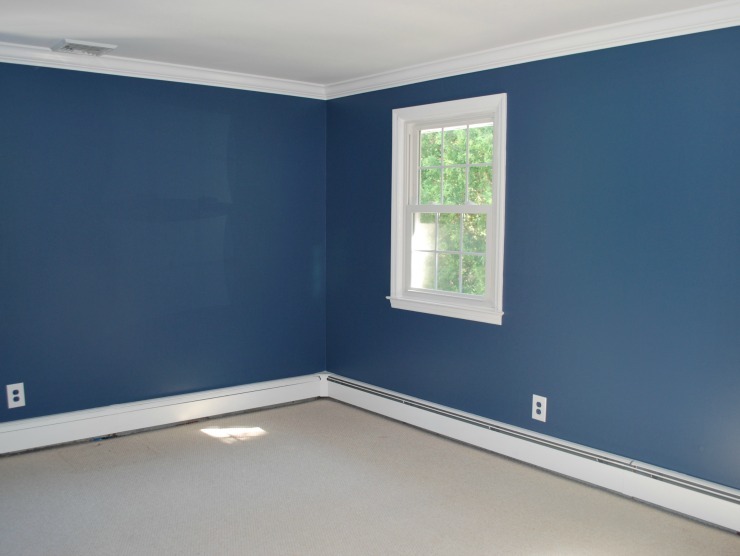 A coat of bright white paint on the window trim and moldings added a nice contrast to the bold hued walls. Shopping at Raymour & Flanigan couldn’t be easier. After perusing their website for various furniture pieces, I headed over to their local showroom to check out all my selections. 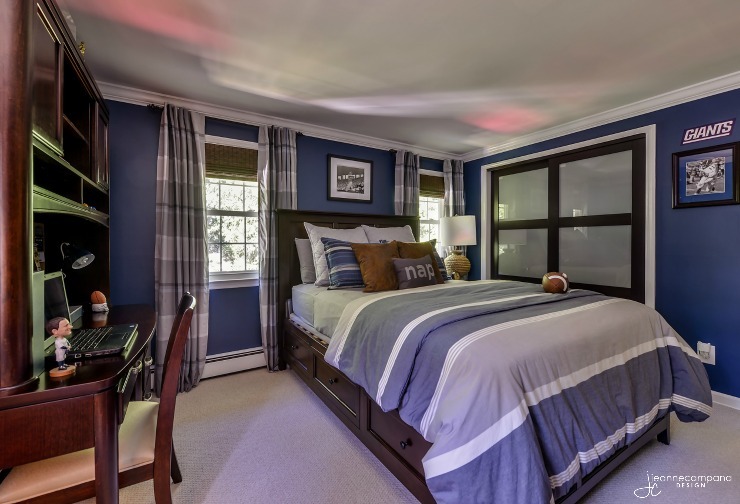 The main focal point of the room is the bed and I situated this gorgeous Keystone Platform Bed on the room’s largest wall between the two windows. 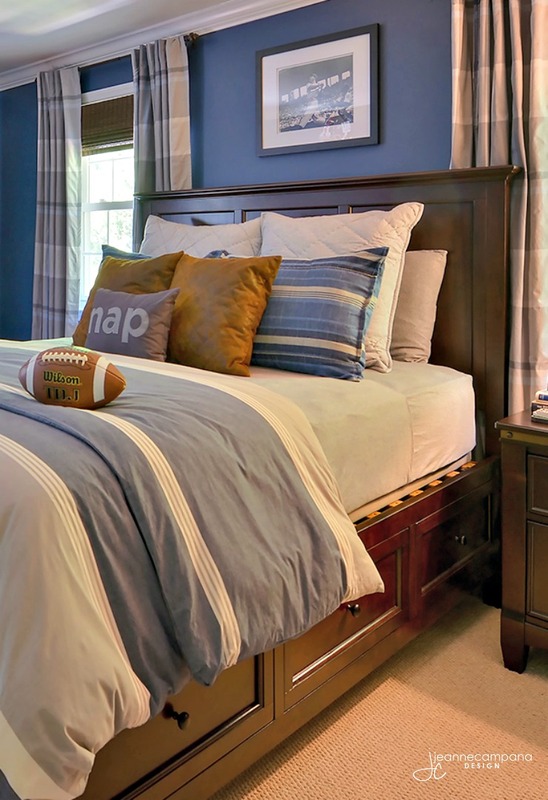 Complete with six spacious drawers, this piece serves double duty for sleeping and providing much needed storage. 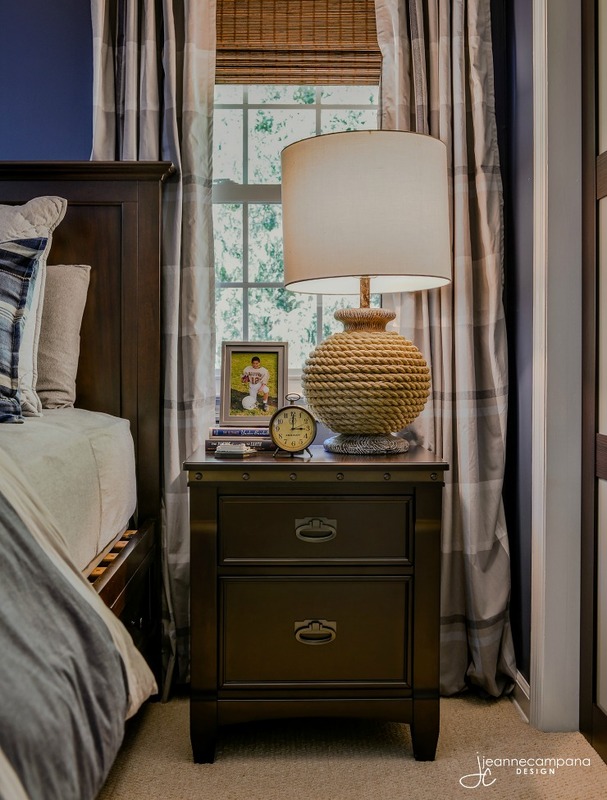 When searching for the perfect bedside table, I was immediately drawn to the Altair Nightstand. I love the metal edge and riveted details. Finally, the Monterey Desk Lamp, with its rustic features, rounded out the furniture grouping. I also wanted to give Nick a large desk that was spacious and storage rich. The Jayden Computer Desk and Hutch fit the bill. 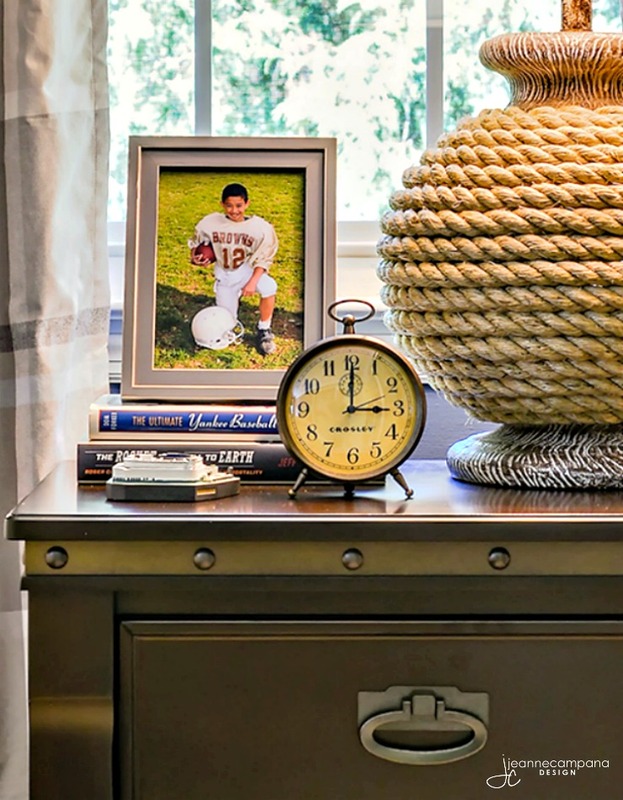 Not only does this piece have enough room for books, paper and supplies, it also has enough shelf space to display personal items, awards and Nick’s growing collection of sports memorabilia. 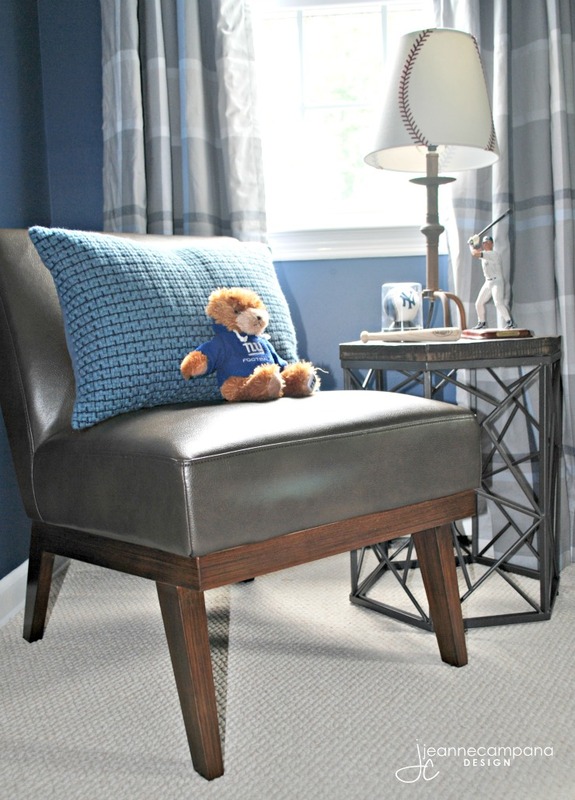 Along with the Jayden Chair, Nick now has a comfortable place to read and study. 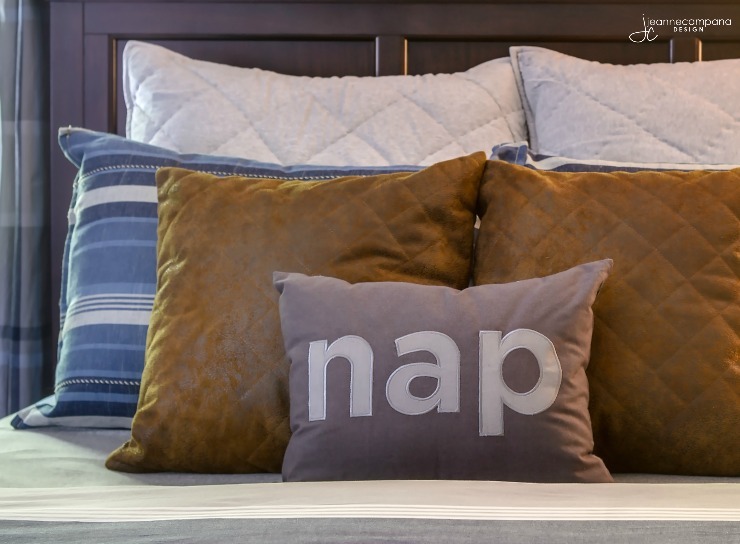 When it came time to choose bedding I wanted to select something with a masculine feel but light in color to offset the dark walls. 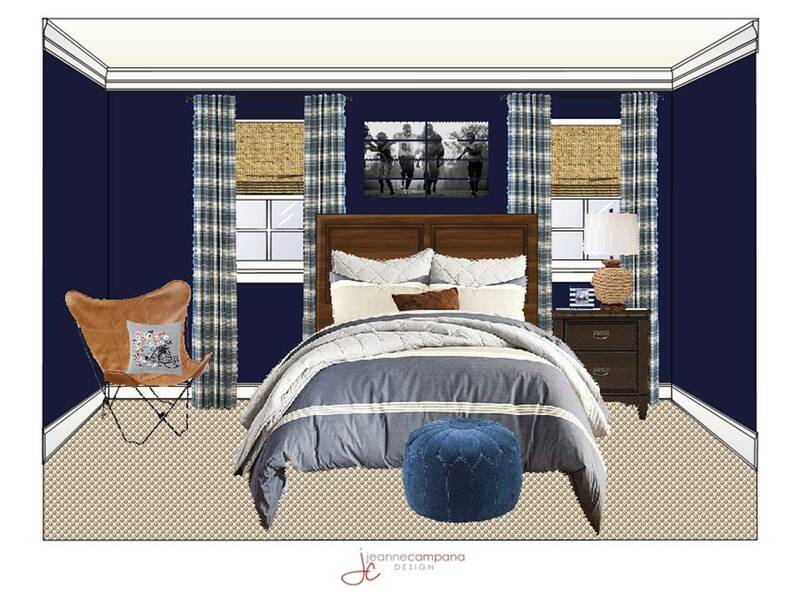 The gray and navy bedding from Pbteen paired with an eclectic mix of pillows in shades of blue, brown and gray was just what I was looking for. 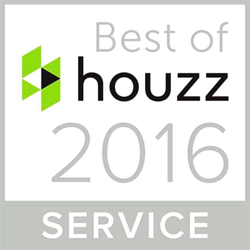 Plaid patterned window treatments and custom woven wood shades were the finishing touch that finally completed the overall look. Bedding: PBteen Beachstone Stripe Duvet Cover (No longer available) Similar here.